Bahia Principe El Portillo Review: Set directly on El Portillo Beach and minutes from Las Terrenas, Bahia Principe El Portillo is the perfect marriage of tranquil paradise and bustling activity. 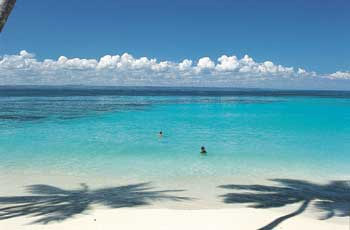 The lush gardens and beautiful white sand beach of the resort provide the ideal atmosphere in which to unwind. 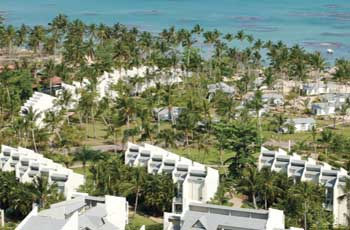 Las Terrenas is the local town, minutes from the resort. What used to be a sleepy fishing village is now a hopping town with shops and restaurants that cater to vacationers while maintaining an authentic Dominican feel. 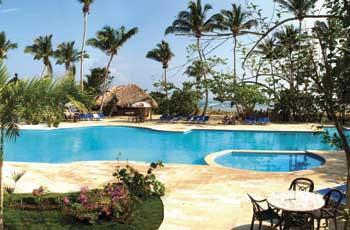 Bahia Principe El Portillo Resort offers all of the charm and luxury of the Bahia Principe family. Delicious food, well appointed rooms and well manicured grounds make up the perfect vacation destination. Sip a drink by the pool, under an umbrella or in our pool side solarium. 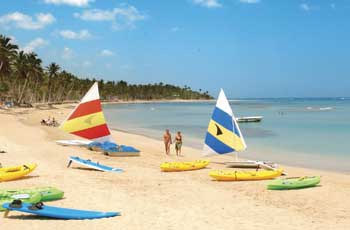 Bahia Principe El Portillo offers a variety of activities and entertainment. Samana is a favorite ecotourism destination with its dedication to protecting the habitat of the humpback whales that are locals to the region and a definite highlight to any visit. Samana offers a variety of excursions along with whale appreciation tours, such as deep sea fishing, hiking, and island hopping among others. Bahia Principe El Portillo Review Accommodations: 396 rooms offer the luxury and comfort guests of Bahia Principe Resorts have come to expect. 204 standard rooms and 192 Junior Suites are equipped with King Size or Double Beds and air-conditioning. Private balconies and terraces let you step out into the paradise of the Dominican and soak in the spectacular views of the Ocean or the lush tropical gardens. Bahia Principe El Portillo Review Activities: With a resort set directly on the beach guests expect great water activities and Bahia Principe El Portillo offers just that. Bahia Principe El Portillo caters to families with children with their mini-club designed to entertain the younger guests of the resort. The resort also offers tennis, paddle tennis and diving lessons in the pool. Fitness buffs can take advantage of the gym to maintain those beach ready bodies. Bahia Principe El Portillo Review Spa: Pamper yourself at the Bahia Principe El Portillo spa which offers a variety of treatments to help replenish your weary soul. Rejuvenate your skin with pre and post sun treatments and hydro-massage will alleviate your stress. Choose from all sorts of packages and walk away refreshed and glowing. Bahia Principe El Portillo Review Restaurants and Bars: Four different restaurants offer Oriental and Gourmet cuisine as well as the fisherman’s specialty and a buffet restaurant. Restaurants are air-conditioned for your dining pleasure. Reservations are required in the a la carte restaurants. Vegetarian cuisine is also available. There are four bars in the resort and a large lounge area. Grab a drink and relax by the lobby bar, the snack bar, the pool bar or the beach bar. Bahia Principe El Portillo offers everything you are looking for in the perfect vacation for your family, a romantic getaway, a soothing retreat or maybe you are simply looking for paradise. Anxious for your trip to El Portillo Samana? Hit any of the "Get Quote" buttons on the page and we'll send you a booking confirmation form or give us a call toll-free and we'll answer any questions you may have. Let's make that dream vacation a reality - join the Punta Cana Information Guide Family. Do your own Bahia Principe El Portillo Review this season!